Probably the most obvious function of the Rosary is as a prayer counter. Prayer beads are found in a number of religions, and a string of beads is the obvious improvement over the pile of pebbles that the Christian Egyptian monks moved one at a time as they recited the Lord’s Prayer, over and over. But to understand the Rosary more fully, we need to go back to the Old Testament and the Book of Psalms. You probably know that there are one hundred-fifty Psalms in the book, and that they are poetic in their original Hebrew. (They even seem to have a certain rhyme in Latin and English.) The Jewish people would sing them as they walked along, and we seem to have a reference to Christ and the Apostles doing so in Saint Matthew’s Gospel. The Psalms were something of a saga of God’s relationship with His people—some describe historical events like the Exodus from Egypt and the captivity in Babylon—others describe God as the great Protector of Israel, and others simply proclaim His praise. The singing or reciting of the Psalms was the practice of the earliest known monks and nuns in the deserts of Egypt. They supported themselves by light labors, weaving baskets or simple garments, and may have recited all one hundred-fifty Psalms during the course of the day. The monks that were unable to read were those who counted their Paternosters with a hundred-fifty pebbles. Pope Saint Damasus I, Pope from 366 until 384, Christianized the Psalms a little bit, ordering that each Psalm be concluded with the “Glory be to the Father....” He is also the one who gave us the practice of alternating the verses between two groups of people. Saint Benedict of Nursia laid out the hundred and fifty Psalms in such a way that the monks could chant them all in the course of the week. His plan is still followed in traditional monasteries, and a similar one by other traditional priests and religious. A bit later, and spread over a few centuries, the practice began of singing an “antiphon” before and after each Psalm. Antiphons are bits of music that are more elaborate than the rest of the Psalm chant, and which are intended to point out some specific meaning in the Psalm. Often they are phrases intended to add Christian meaning to the Psalms. That is to say that the antiphons on feast days generally point out the exploits of Christ and His saints. For example, the antiphons framing the Psalms of Christmas refer to His Virgin Birth, and to the witness of the shepherds and the angels; the antiphons of Easter refer to the Resurrection and the empty tomb; and those of Pentecost to the descent of the Holy Ghost and His effects on the Apostles. But, one has to remember that, for many centuries, the ability to read was enjoyed by a very small percentage of the population. The ability to read a hundred and fifty Psalms; and the ability to read the various antiphons throughout the year belonged to a privileged few. And even those who were literate could not read the Psalms when they traveled on horseback, or worked in the kitchen, in the fields, or in the shops. But that did not mean that these people didn’t pray. 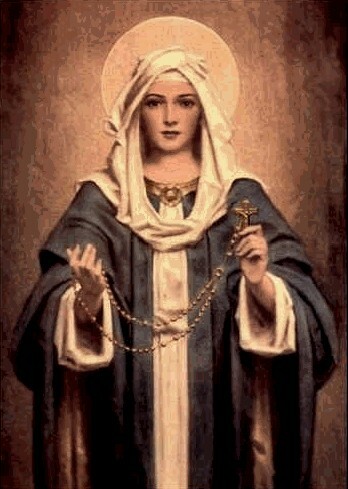 For these people the repeated recitation of the Lord’s Prayer—and, increasingly in the middle ages, the repetition of the “Hail Mary”—using a chaplet or string of beads, became rather common in place of the Psalms. As it was not possible to memorize all of the antiphons of all of the feasts of the year, religious people began to develop a set of antiphons that would be recited every day, and which would present the major events in the lives of Jesus and Mary. Some medieval manuscripts give an antiphon for each of the hundred and fifty “Hail Mary” beads—but even that took a prodigious memory, and the practice of dividing the hundred-fifty beads into “decades” of ten beads became rather common. Today, when we recite the Rosary and announce a “mystery” before each decade, we are reciting one of the fifteen antiphons that summarize the events of the life, death, and resurrection of our Lord. And we ought to be conscious of those antiphons or meditations—the Rosary ought to be more than rote repetition. As we recite the “Hail Marys” in the background, we ought to meditate on those mysteries. The first mystery is the Annunciation—but it is not enough just to pronounce that fact in words. During that decade, we ought to consider what it must have been like for Mary to become aware of God’s plans for her. Likewise for each mystery, we should devote some thought to what it would have been like to be there at the time. What impact did these events have on Jesus and Mary; on the people with them; and on us? The Rosary was the ideal tool for Saint Dominic and others like him to preach the Catholic faith in places where the people considered all material things evil, created by a “bad god,” who was in constant warfare with the “good god” who created only that which is spiritual. The Rosary points to the truth that there is only one God, all good, who made everything, material and spiritual. It points to the truth of Jesus and Mary, living their lives both in the spirit and in the flesh. The Rosary was the ideal tool for Pope Saint Pius V to unite Catholic Christendom in prayer on this very day, Sunday, October 7th, 1571, as a papal fleet lead by Don Juan of Austria fought the naval battle in the Gulf of Lepanto near the Greek city of Corinth. For centuries the Moslems had controlled the Mediterranean, blocked shipping, raided the costal cities, and took Christian captives—Don Juan, the battle of Lepanto, and Our Lady of the Rosary began to change all that. Our Lady’s intercession is similarly credited for victories against the Turks at Vienna, Peterwardein, Corfu, and Belgrade in the 17th and 18th centuries. In the 21st century we face similar problems. The heresy of Modernism is every bit as pernicious as the heresy with which Saint Dominic had to contend in the 13th century. Perhaps more so, for Modernism falsely claims that truth itself is constantly changing; and that the life, death, and resurrection of Jesus Christ are not historical events; that they are “true” only in the pious sentiments of religious people. Civilization itself depends on unity and truth. The Rosary is the ideal vehicle, available to every man, woman, and child, to invoke God’s graces on our fallen world, to restore that unity and truth. Each and every day we have the opportunity to meditate on the life, death, and resurrection of Jesus Christ and His Blessed Mother. Each and every day we can imitate what those mysteries contain. And, if we are faithful, we will obtain what they promise—for ourselves, our families, and all of Christendom. Our Lady of the Rosary. Pray for us! !